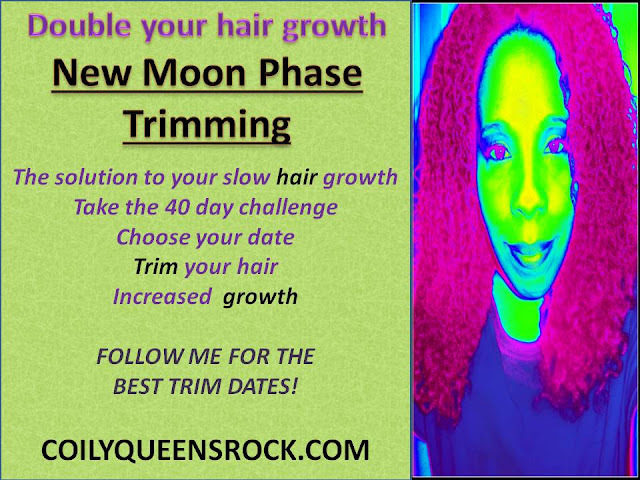 Use the energy of the New Moon as it grows to stimulate your hair growth rate. Trim your hair on the right high energy days and received increased hair growth. Lots of people are doubling their hair growth rate with New Moon Phase trimming. Coily Queens gives you the best high energy trim dates every month. Be sure to subscribe to this site so you can receive them each month. 2. Choose your high energy date. 5. Easily trim your hair by two strand twisting it. DOES IT MATTER HOW MUCH YOU TRIM? No, you decide how much you want to trim. The amount will not affect the New Moon increase. HOW SOON CAN I EXPECT GROWTH INCREASE? After you trim write down your length. Then remeasure your length in 40 days. You should notice significant increase over the way your hair usually grows back. Usually double your hair growth rate. DO I TRIM EVERY MONTH? No, you follow your regular trim schedule. The CQ method recommend trimming every 4th month. This is 3 times per year. You can expect growth increase from one New Moon Phase trim up to 3 months after one trim. Do I put it in maybe 4 big twists or lots of little ones? Thanks. I've been waiting on these. I trimmed mine on your dates a couple of months back and my hair grew so fast! Still growing! The smaller twists give you a better trim. I recommend 2 by 2 inch twist sections. Hi, what do you mean 2 by 2 inch twists? Could you please explain? Thanks. I'd like to try it. Measure 2 inches down then 2 inches wide, use those size sections. Thanks so much and God Bless You for providing this information. We are in July now and I believe tomorrow (July 4th)is a perfect New Moon Trim date. Can you confirm this? I will take off a 1/2 inch all over. I appreciate it in advance. Also, does the Moon have to actually be out in the sky when I trim; like at night time. Hope that wasn't a crazy question. 5 awesome style products for your twist outs!